To renovate or build new for the Buffalo Bills is the big-money question looming over the football team and the region. And Gov. 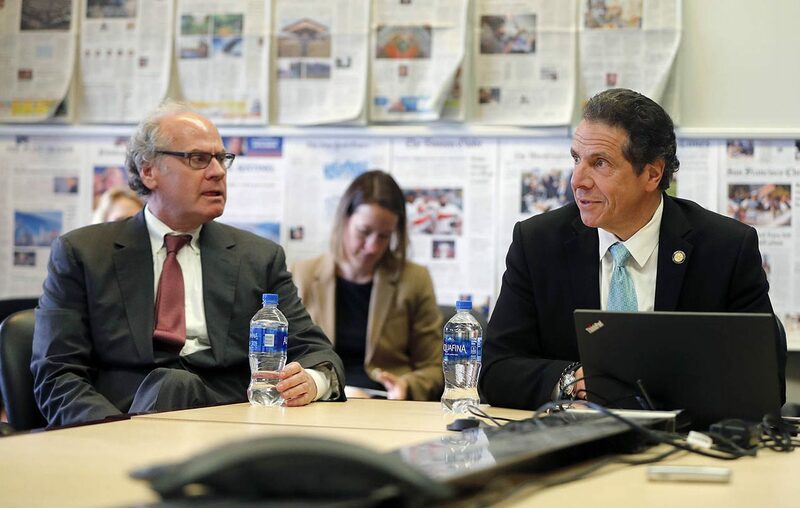 Andrew M. Cuomo – who likely would have to be on board with providing the large amount of state money that would likely be part of any project – wasn't tipping his hand Wednesday on whether he prefers one option or the other. "That's not a big thing. That's a ginormous thing," he said, noting that the state has supported previous renovations of New Era Field. "The improvements in the stadium were a big deal," Cuomo said in a meeting with Buffalo News editors and reporters. "We were very active in keeping the Bills here." But as to whether he prefers the more costly option of building a stadium or the lower-priced alternative of renovating New Era Field, he wasn't saying. Instead, Cuomo deferred to Howard Zemsky, the state's top economic development official, who said he would wait to see the results of the research now being done on the stadium issue for Bills owners Kim and Terry Pegula. "What comes up in the future, we'll deal with it then," Cuomo said.